I have to say I am a frequent traveler of Thailand. 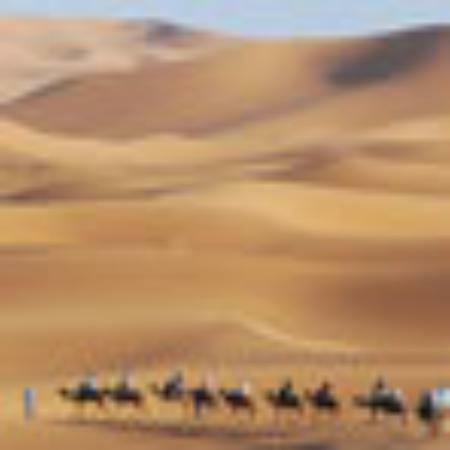 I have traveled to many places and stayed in some of the amazing resorts around the world. 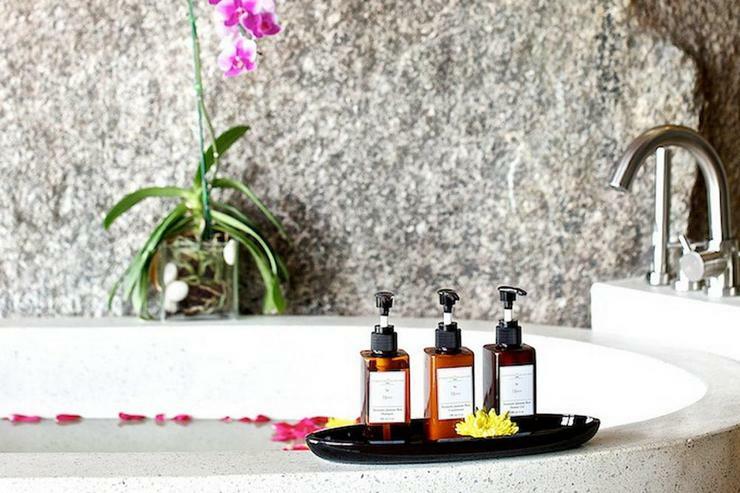 By far Baan Hinta Villa has thought of it all, with every amenity you can possibly think of. From the Bose sound system throughout the property to the outdoor movie screen over the pool for evening entertainment. 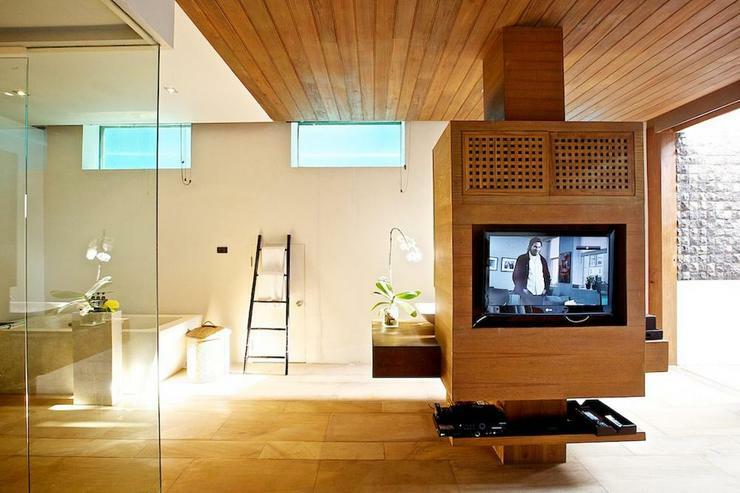 Plasma TV's in every room and bedroom. For us Americans that are not use to the hard beds in hotels throughout asia, these beds where very comfortable The sheets and down pillows were quality with a high thread count. 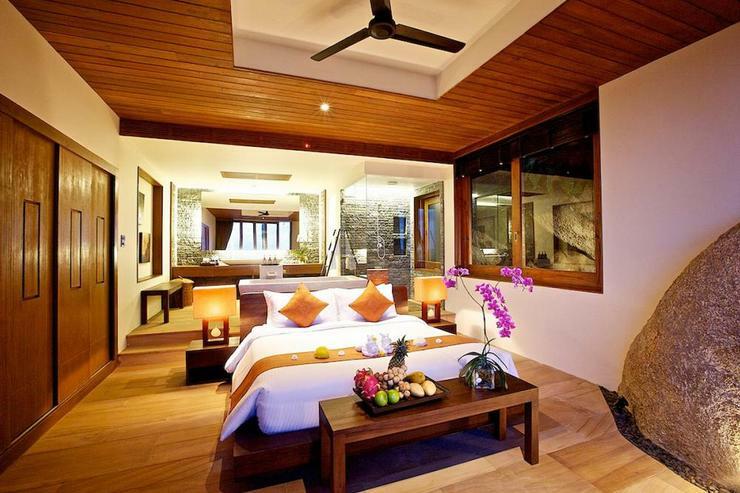 The rooms were decorated very tastefully along with award winning architecture. 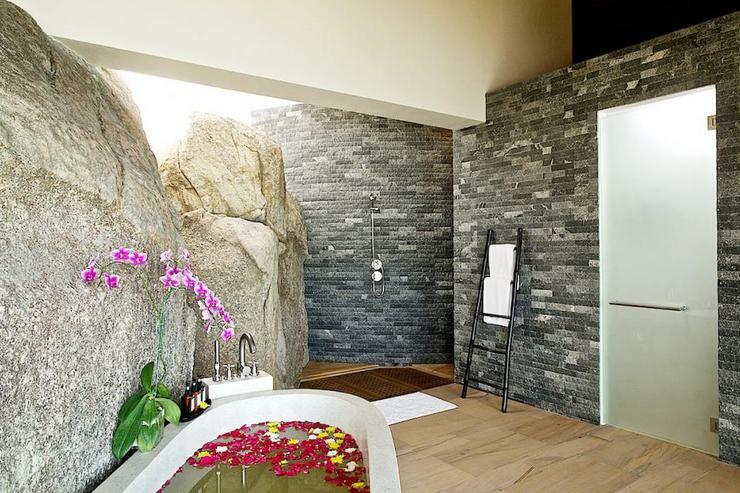 If you look at the roof lines of the home and the glass walls piercing down into the massive boulders you will simply be amazed. The large glass pocket doors fully open up giving you the most amazing view throughout which transcend outside and across the infinity edge tiled swimming pool across the ocean. You have a full ocean view from every bedroom. May I mention every room is pretty much a Master bedroom except one room that has two beds. It still is appointed as if it was a master. Let's not forget the staff. 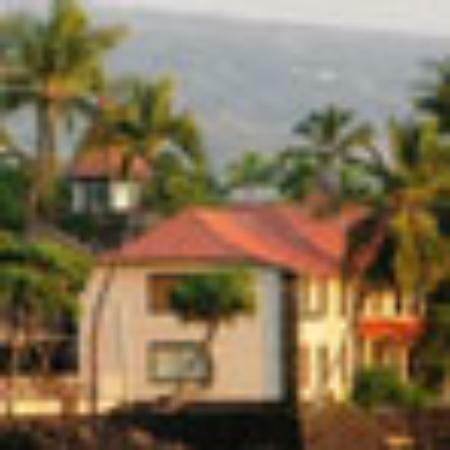 From the beginning of the stay you feel so comfortable having them in your private villa. They make you feel so welcome. They do the nice little gesture throughout the day; bringing you fruits and drinks out at the pool when you don't ask. They fix little appetizers when they think you may need a little bite of something. They organize all your car, or scooter rentals or day trips. It was very nice having them around to help. I feel as if by the end of the vacation they will be missed. They truly make the experience. We held a little cocktail party for a few friends. They took control of the details of the party and it turned out wonderful. They have fresh woven banana leafs all over the table and fresh flowers. The fruit was used as cut out decorations. It was very impressive. We could see them working all day setting this up. Of course last but not least, the amazing chef. What can't he do? The food was always cooked with a big happy smile on his face. He definitely came from a 5 star restaurant. He could make anything with his little twist on the dishes. The presentation was very classy. His design on the plates came out very artistic. It makes my mouth water thinking about his cooking. 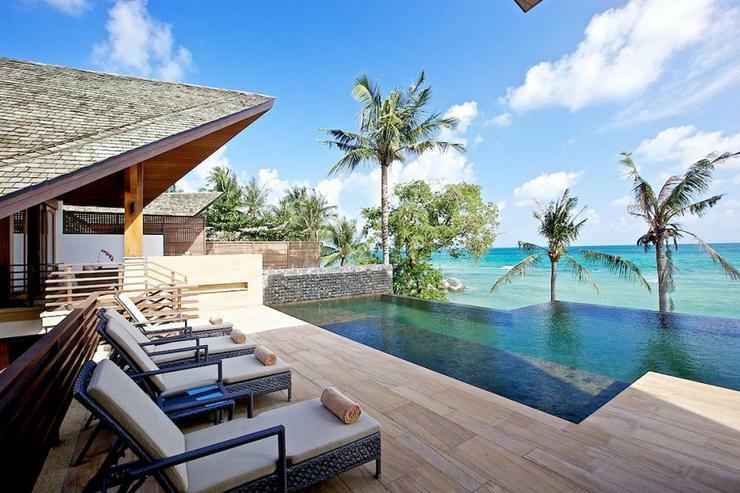 You can't go wrong with this villa. It's a must stay on this island if you're making a choice. 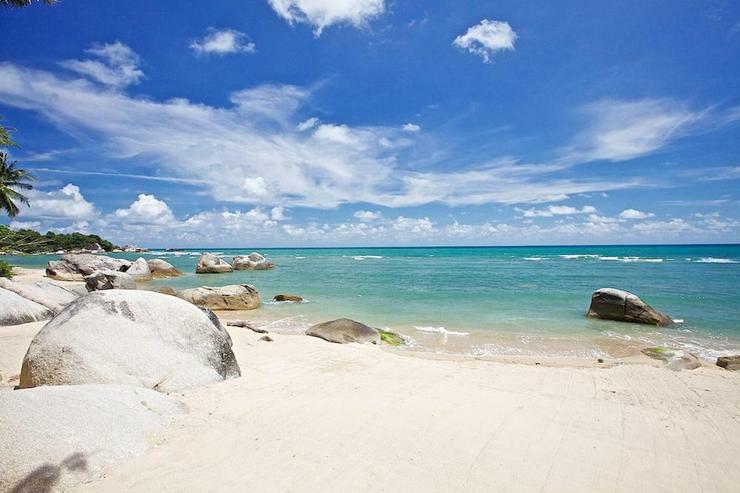 Having started in Bangkok for 4 nights we were really looking forward to the peace of Koh Samui and Baan Hinta. To say we were not disappointed is an understatement! !, from arrival to departure the experience was amazing. The manageress, Gift, took care of every little issue and question and always with a smile. The chef was on hand to cater for all tastes and the prices were very reasonable - usually coming out at around £10 per head for a full meal with starters etc!. The villa is amazing with fantastic views and facilities, 4 of the 5 bedrooms have wonderful sea views and all 5 bedrooms are massive!. 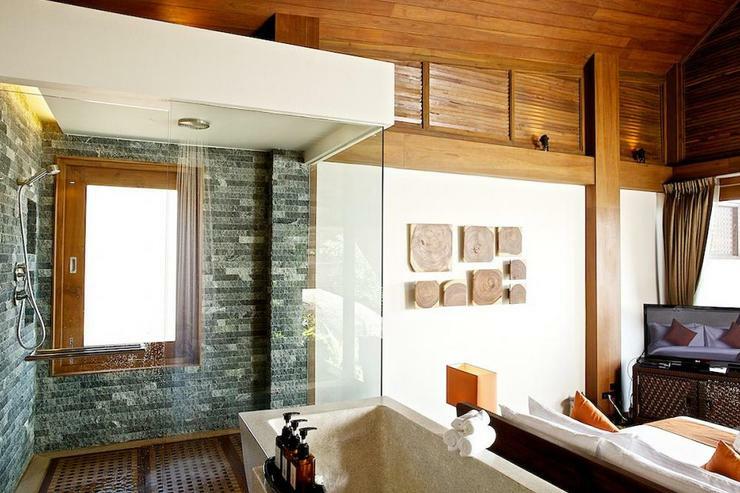 We were lucky enough to have the master suite which was amazing. There is currently some building going on next door but the villa managers were excellent at dealing with this for us. 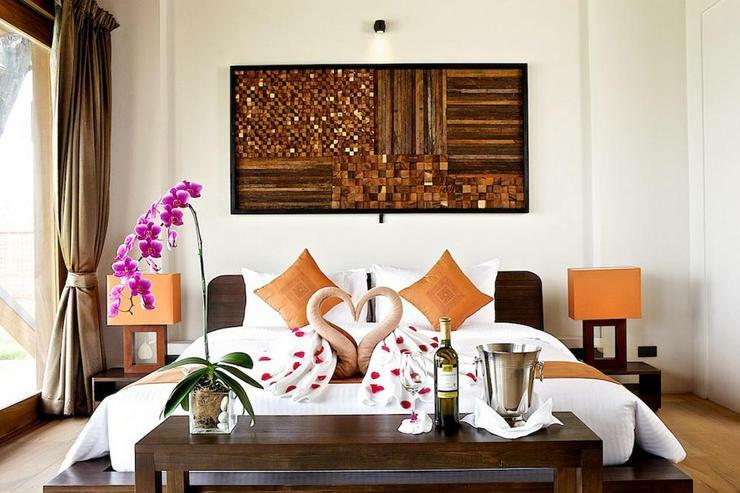 Obviously this is not cheap accommodation, but if you have several couples to share the cost it is actually great value. My only criticisms were the lack of English tv channels(most didn't work due to poor signal) and the showers, they were amazing to look at but had very low pressure. An Outstanding experience which I would return for. 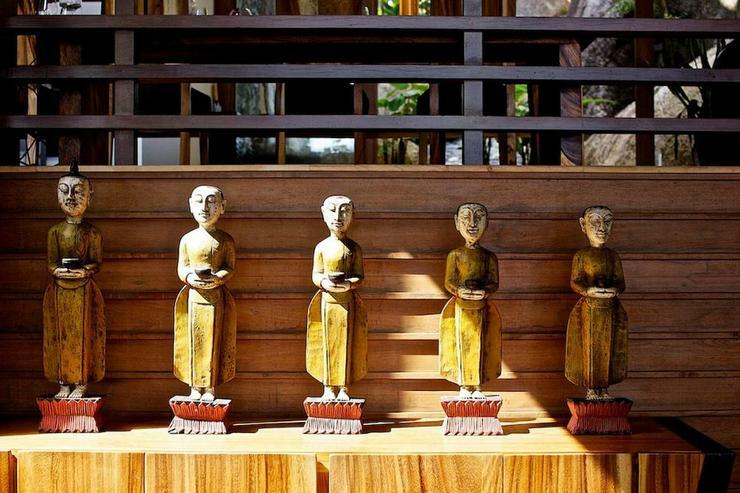 Chef Ole and manager Jee provided superb , caring service and authentic Thai dishes everyday. Never have I eaten such complex Thai food and felt such warmth experience. 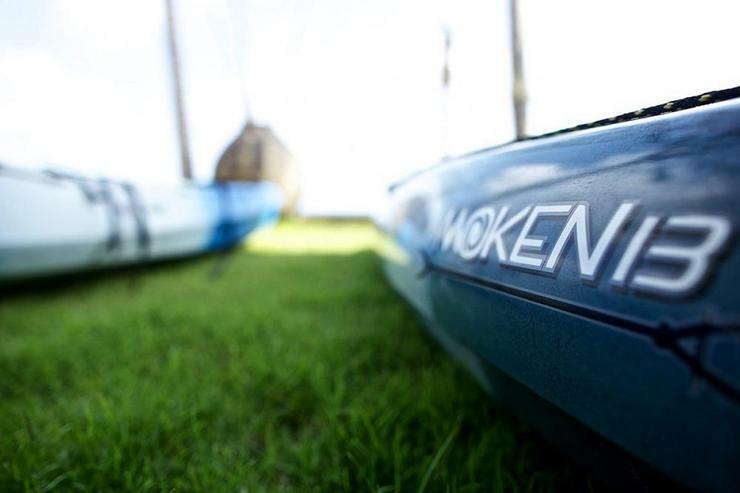 Absolutely brilliant experience, service was second to none! 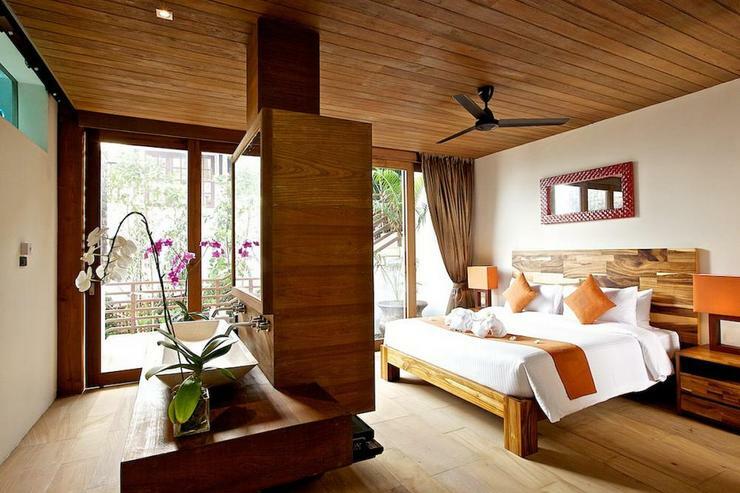 We stayed at Baan Hinta for the month of August and had the most amazing time. Gift (manageress), the Chef and the staff (Nit, Ning and Tam) were absolutely amazing. They made our stay a complete success. The villa itself is beautiful and there is no longer any construction next door (the small resort is complete). 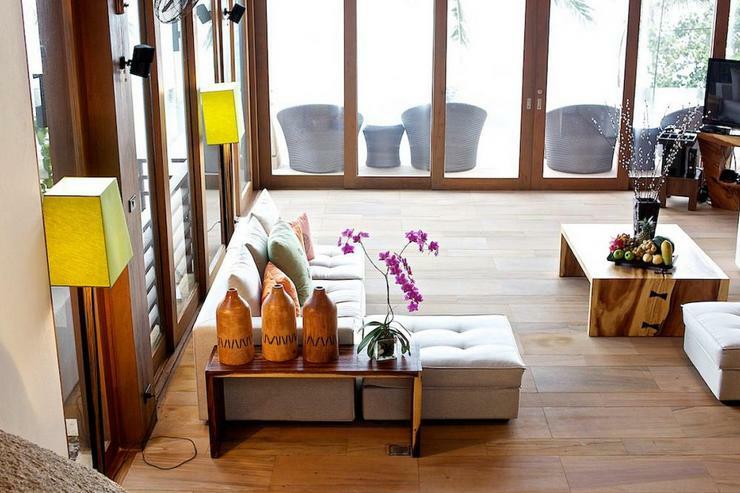 The villa was kept sparkling clean and every request we had was addressed immediately and better still, with a smile. We had a few technical problems with the sound system etc and Gift sorted these out quickly and thanked us for bringing any of these types of things to her attention. The food was unbelievably good and we quickly left it to be "Chef's Surprise" for every meal. We had lots of visitors while at the villa and the team always made them feel special and welcome. They put on a wonderful lunch for 20 guests one day which was amazing and created a great atmosphere for all the children. Gift was incredibly good with our 3 year old twins and always made sure that she had little activities for them to do (feeding the pond fish, playing with a horse made out of coconut leaves etc) and took them off to look at things around the villa to give us a break from time to time (without even having to ask!). I read in the visitor book a great quote about Gift in that she should be running a corporation, she is THAT good. If we could have taken her home with us, we would have. 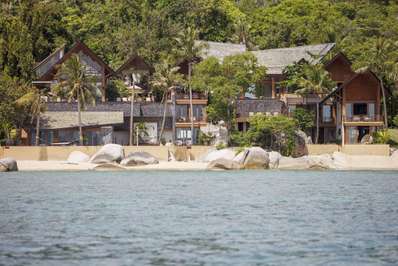 So, in short, if you want a beautiful villa in a divine location with sensational food and better service than a 6 star hotel, then this is the place to go. And I am a hard judge! This villa was perfect for our group. Plenty of party area but also room to get away. 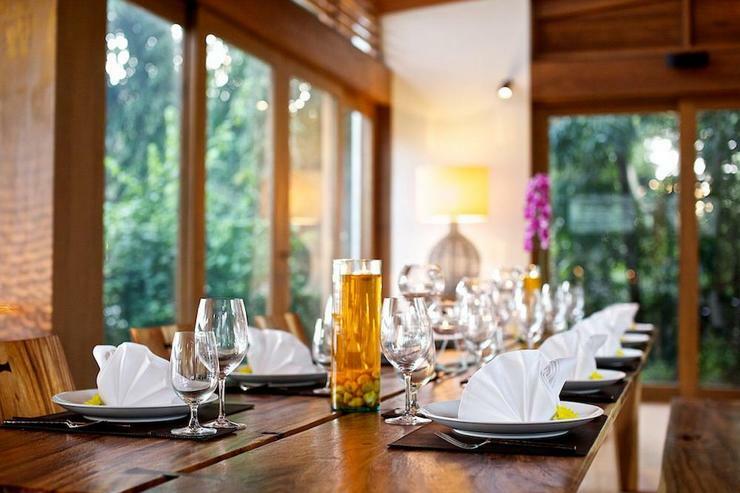 The staff are fantastic, especially Kib the villa manageress and the chef caters perfectly for any meal. 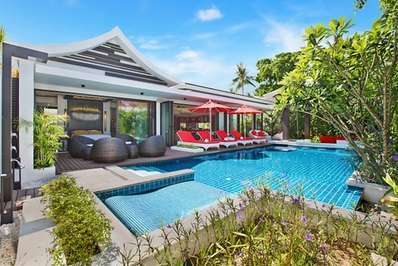 Great pool overlooking the beach and comfortable living/dining area Only drawbacks are that its a distance from Chaweng, the main location on the island. Lamai seems to be turning into bit of a backwater. And the beach below the villa is not really suited for swimming though its good to get out on the paddleboards. 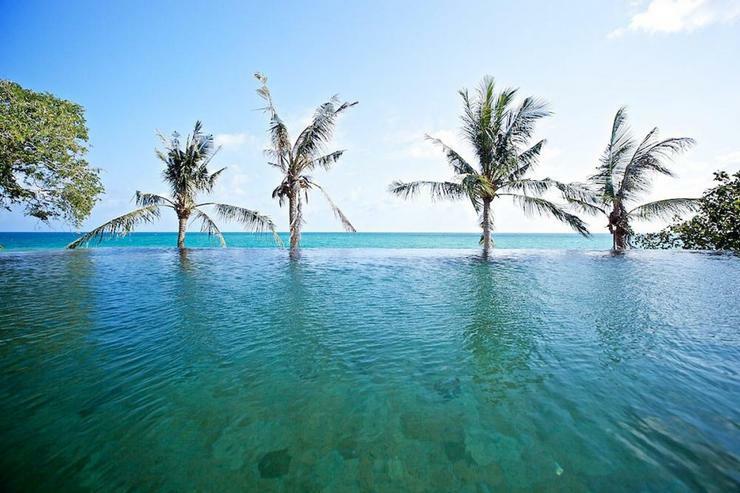 If there is paradise, this is it! We stayed there for a week with 4 families. My god, this place is simply heavenly! The view and amenity is 7-star; the stuff and cook made us impossible to go out to eat; we had 6 golfers in the group and played many rounds in Santibury Country Club which is also world-class. Canoeing to Hinta rocks were a treat and flying the hot air balloons for our last night was unreal! 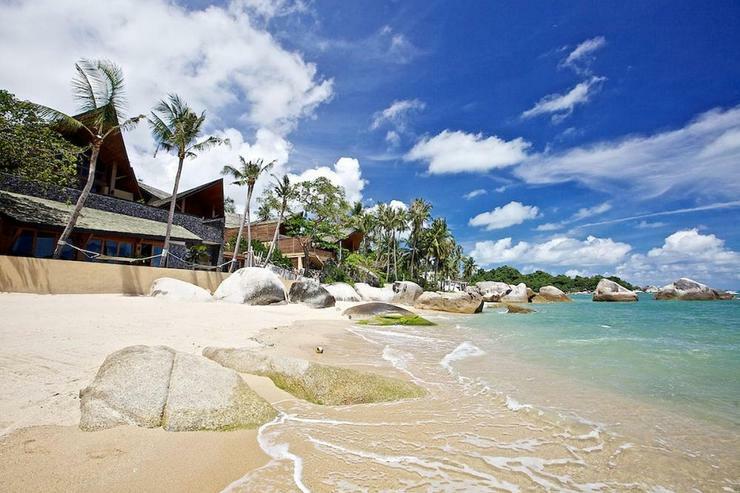 Koh Samui and Baan Hinta are simply the place that we'll come back over and over again! 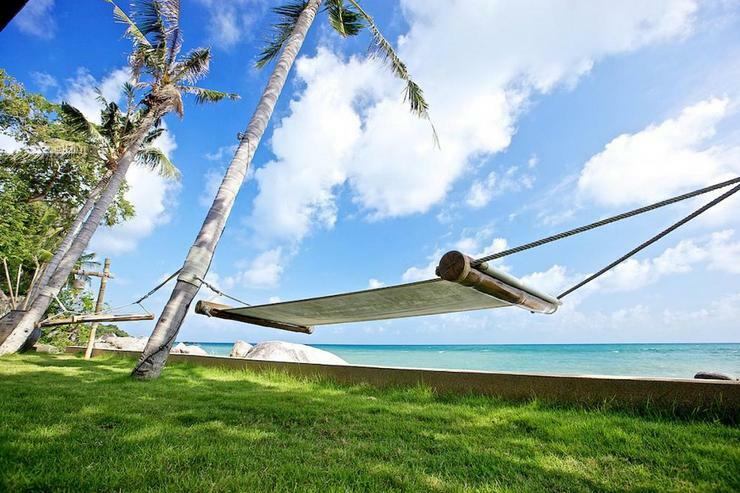 Baan Hinta is positioned on the south eastern coast of Koh Samui about 25 minutes drive away from the International airport and 15 minutes to Chaweng Beach. 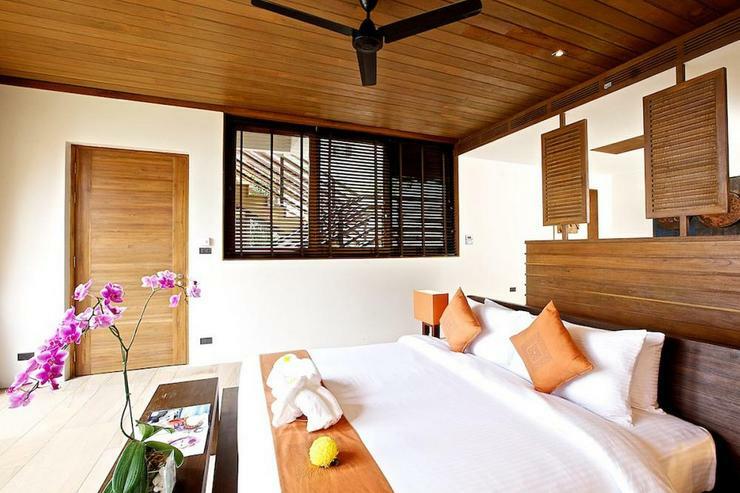 The holiday villa is conveniently set to allow you to soak up the serenity of the peaceful environs and at the same time puts you in close proximity to the island's famous beaches, restaurants and nightlife. 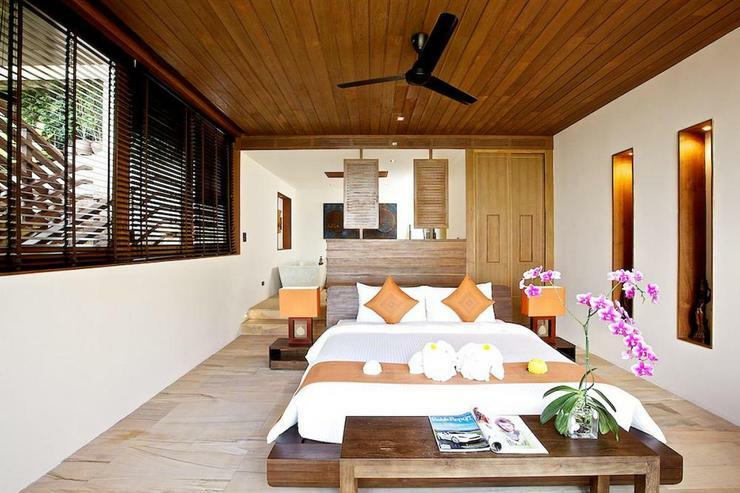 Baan Hinta sets a new benchmark for villas on Samui in redefining luxury, comfort and hospitality. 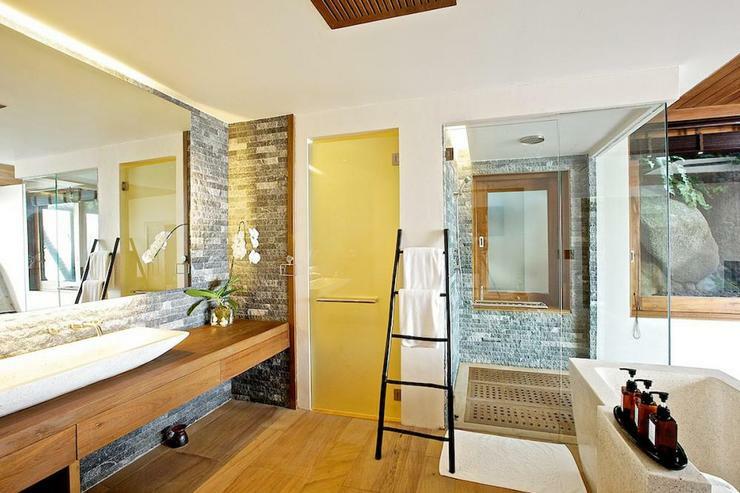 Flaunting a tasteful design and equipped with all modern amenities for a memorable stay, this exclusive property answers all your needs for privacy and space to relax, rejuvenate and spend quality time with family or friends. 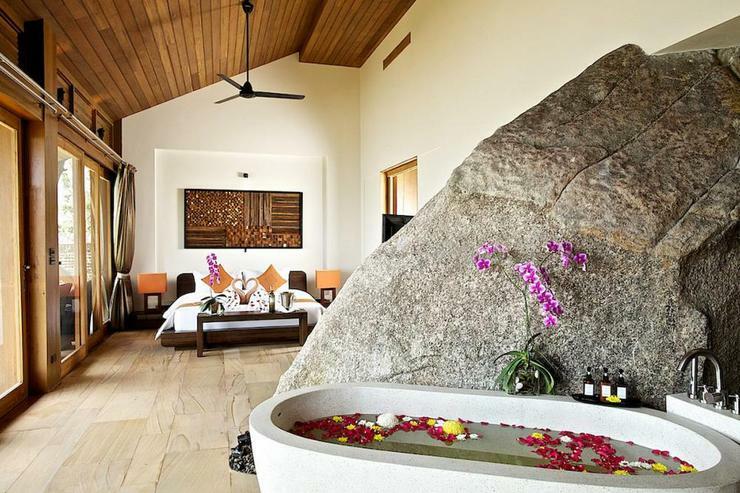 The villa sits on a dramatic sloping site with a series of giant granite boulders cascading into the sea. 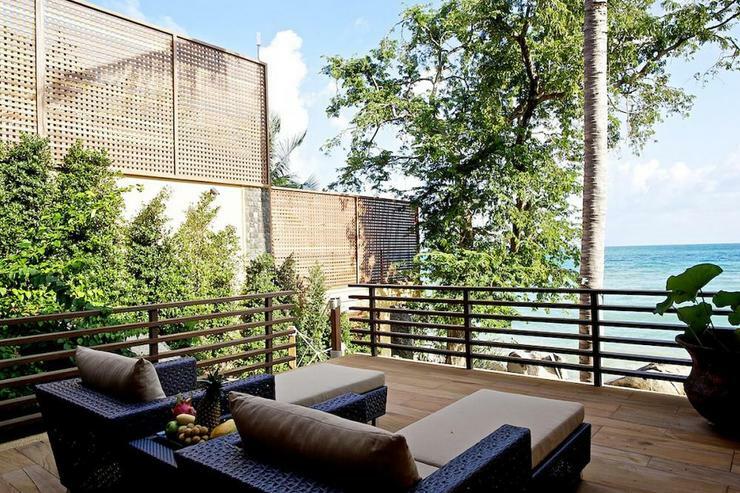 It is luxuriously proportioned to offer expansive views of the ocean and surrounds from all angles. 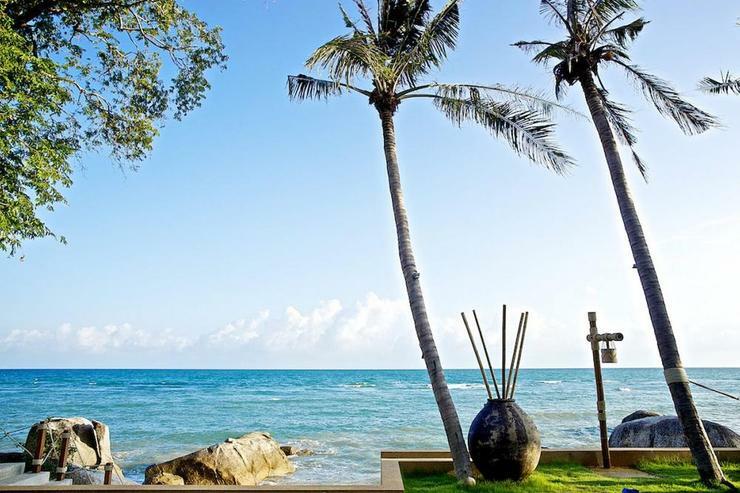 Perfect for weddings and large group of family or friends, the beachfront Baan Hinta features two epic villas which have set up a new benchmark for architecture and interior creations on Samui Island. 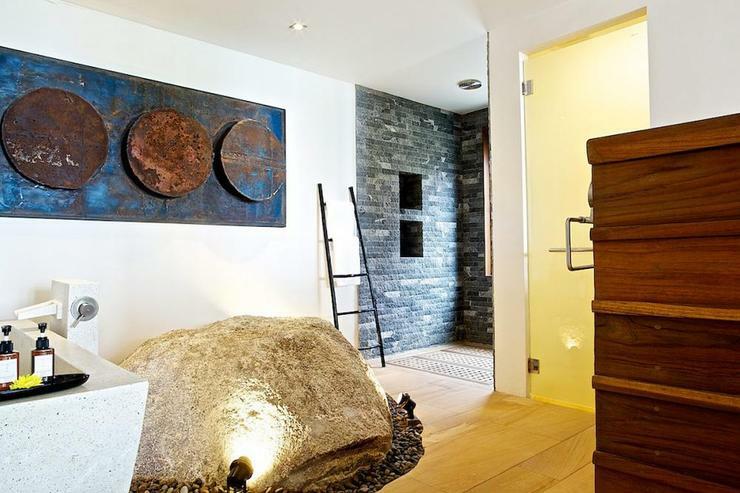 The exclusive property sits between two boulders, offering a fine sense of space and contrast to the rough textures of the natural surroundings. 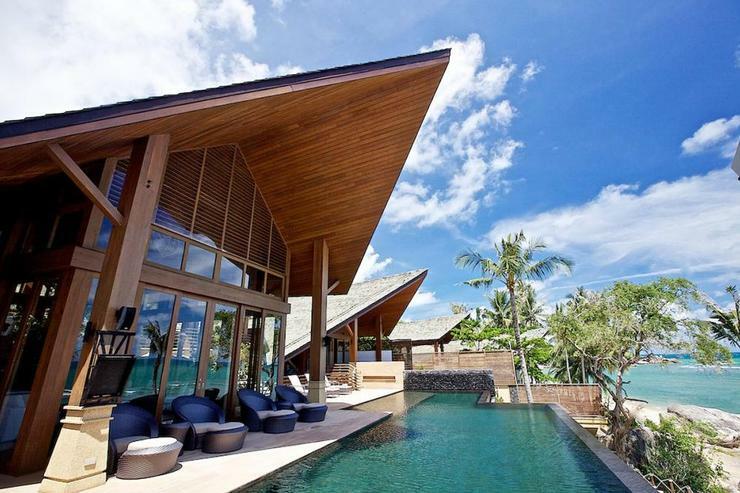 The main highlight of each of the two villas is the interesting roof structures. Covered in cider shingles, the roofs seem to rise and fall rhythmically across the building, rising to provide dramatic lofty spaces over the main living areas and reducing to provide a more intimate setting over the bedrooms. 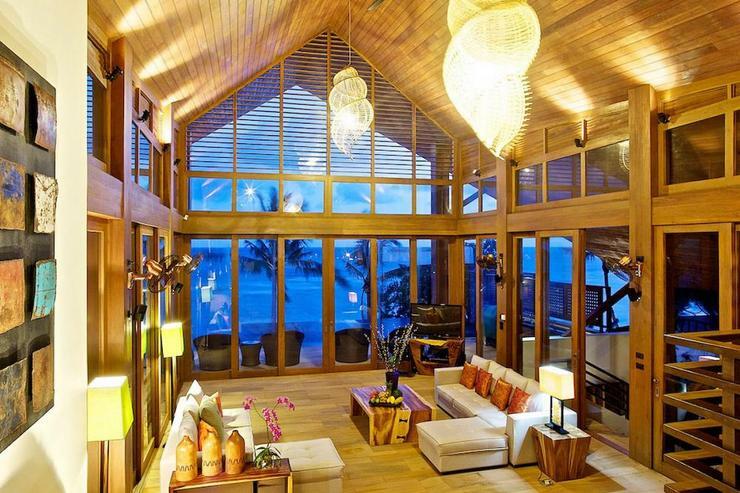 The villa has been designed to allow the guests the best use of indoor/outdoor space. 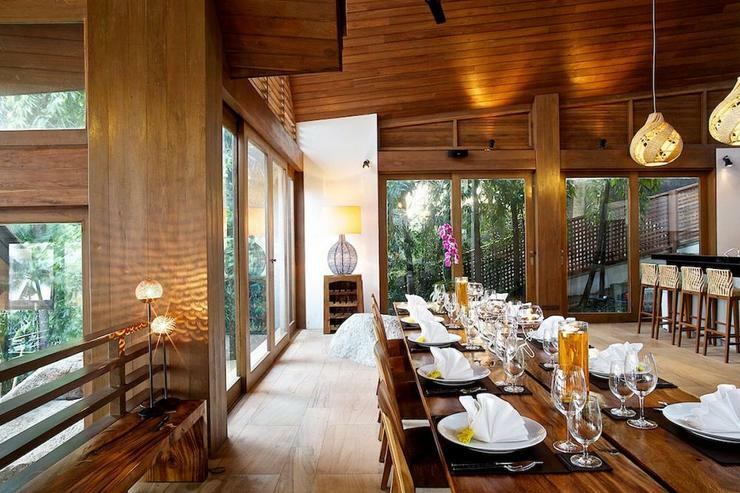 Baan Hinta offers a choice of public spaces for socializing and entertaining including a large living room, open kitchen, lounge sala or pool side terrace. As with the rest of the property, the indoor and outdoor spaces flow into each other giving a sense of continuity and balance to the area. 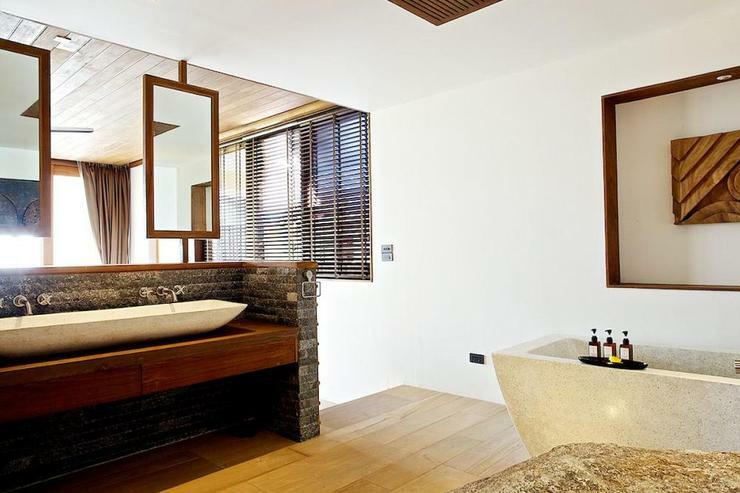 All rooms are luxuriously proportioned with ceilings of up to 10 meters in height to give a sense of space at all times. 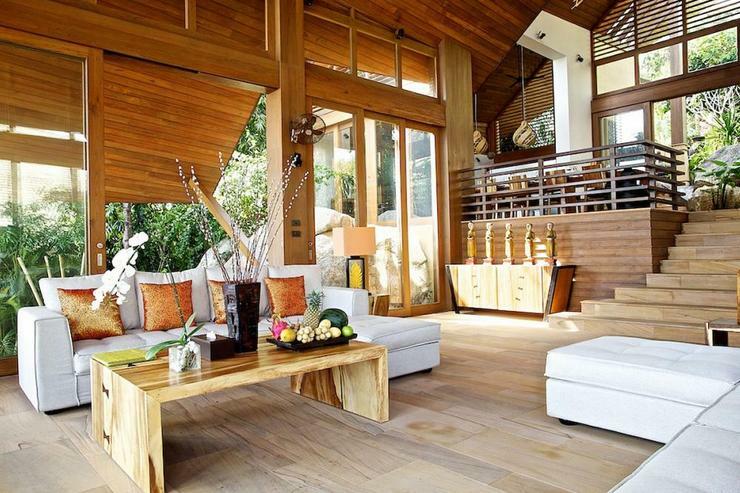 The glass doors offer expansive views to the beach, ocean and beyond. 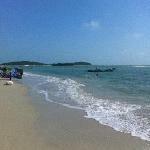 The villa is within easy distance of many restaurants, shops, spas and the famous Hin Ta/Hin Yai tourist site. 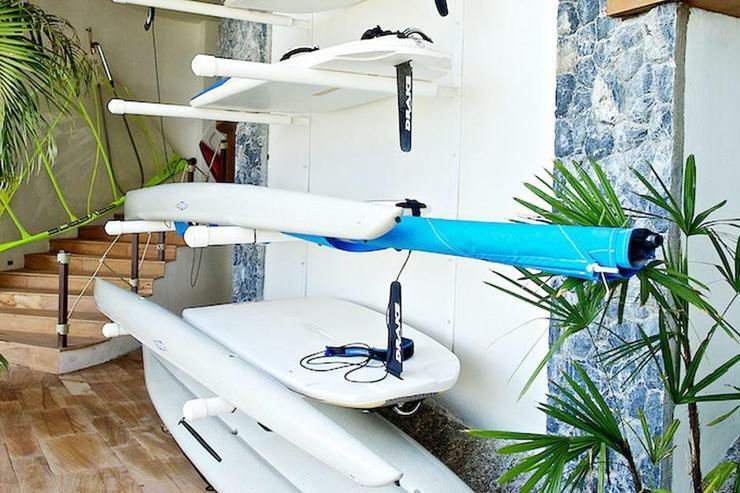 The villa also provides visitors with gears for water sports including wind surf, kayaks, paddle boards, Powerdive snorkels, Bladefish water scudder and Seadoo jetski. 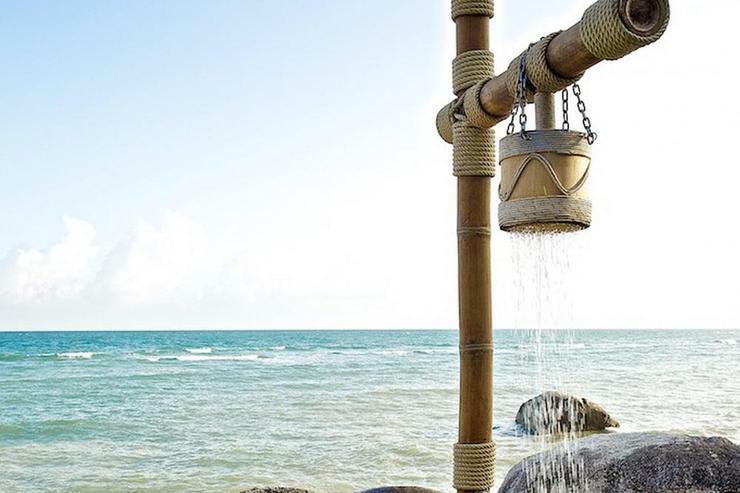 Located in Lamai beach, Koh Samui. 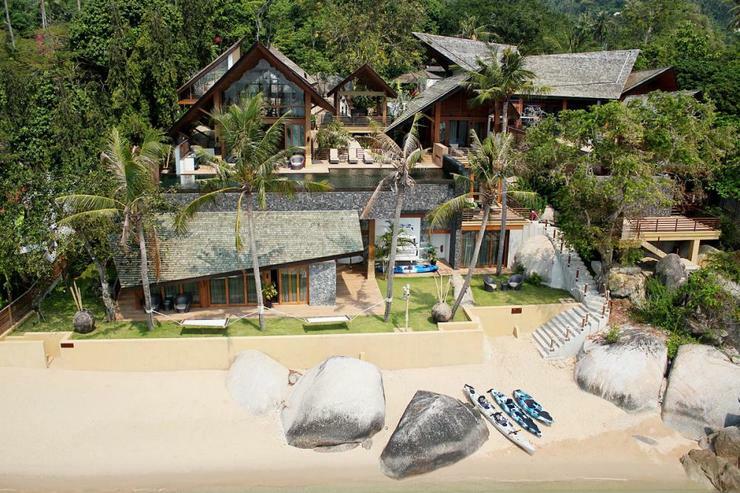 Baan Hinyai is a in Thailand. 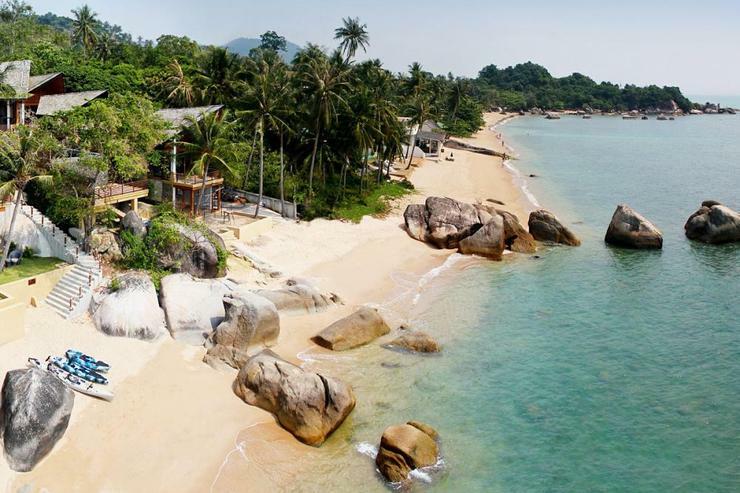 Located in Lamai beach, Koh Samui. 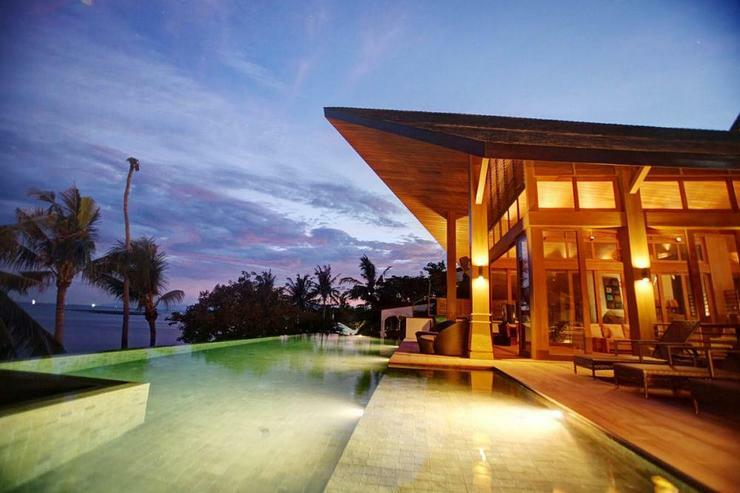 Villa Julia is a in Thailand.